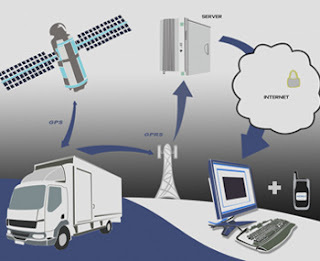 Definition- “A GPS tracking unit is a device that uses the Global Positioning System to determine the precise location of a vehicle, person, or other asset to which it is attached and to record the position of the asset at regular intervals. The recorded location data can be stored within the tracking unit, or it may be transmitted to a central location data base, or internet-connected computer, using a cellular, radio or satellite modem embedded in the unit.” according to wiki. in which Data Pullers are coming into more common usage in the form of devices containing a GPS receiver and a cell phone which, when sent a special SMS message reply to the message with their location. A GPS logger simply logs the position of the device at regular intervals in its internal memory. GPS loggers have either a memory card slot, or internal flash memory and a USB port. Some act as a USB flash drive. This allows downloading of the track log data for further analyzing in a computer. Data pusher:A GPS receiver and a mobile phone sit side-by-side in the same box, powered by the same battery. At regular intervals, the phone sends a text message via SMS, containing the data from the GPS receiver. Data pullers : Contrary to a data pusher, that sends the position of the device at regular intervals push technology, these devices are always-on and can be queried as often as required. the GPS Tracking is now used by various areas such as buisness and police department very freqently such as stolen vehical searching, fleet control, law enforcemnet and etc.